• Powered by a hardware-accelerated transcoding engine, DS218+ allows you to transcode H.264 4K videos to 1080p and stream them to high-definition TVs, digital media players, mobile handsets, and computers in the required format, making it easy to watch videos without having to install a 3rd party player. • Synology DiskStation Manager (DSM) is a sleek, browser-based operating system running on every DiskStation and RackStation, which makes managing your Synology NAS a breeze. Featuring an intuitive user interface, DSM makes accessing and sharing your data smarter and simpler. Synology's Package Center lets you download and install useful add-on packages designed specifically for individual or business needs, meaning you can enjoy more entertainment in your life or better productivity at work. • Synology DS218+ can serve as a centralized backup target. 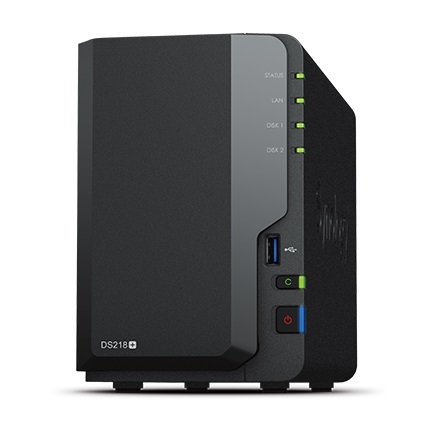 Whether you are a Windows or Mac user, you can back up everything on your computer directly to Synology NAS using Cloud Station Backup. Whenever you modify a file, the changes are backed up to DS216+II automatically. Mac users also enjoy native Apple Time Machine support. You can also back up data from your DS216+II to another DiskStation, rsync servers, external drives, or even Amazon S3, Glacier cloud service, Microsoft Azure, SFR, and hicloud. Synology Hyper Backup allows you to schedule backup tasks and restore the server to any particular point in time, while minimizing storage consumption and processing time by saving only the specific data block that has been changed between versions.